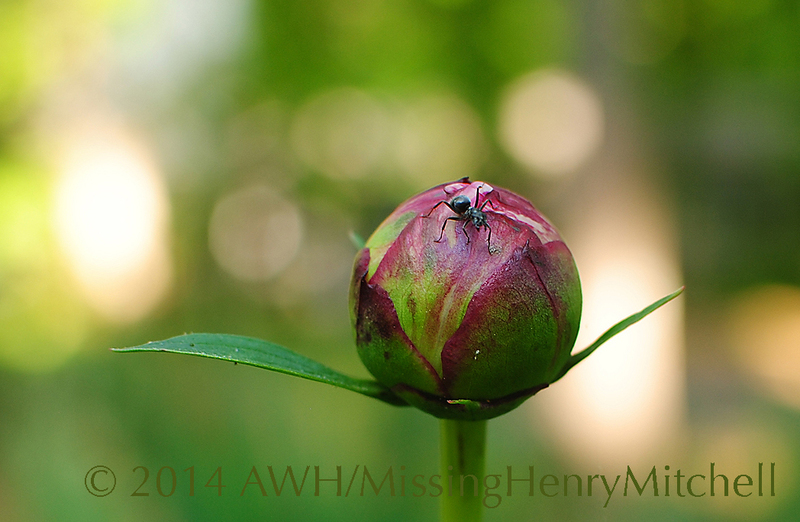 If you grow peonies, you will have noticed how the buds attract ants–sometimes by the handful. The buds secrete nectar, which the ants devour in a frenzy. This does no harm to the plants (so don’t spray the peonies with insecticide!). One day in early May, I took five minutes out of my morning to watch the ants eat the nectar. In the morning light, the ants’ black bodies looked metallic; even occasionally translucent, with black bands running across their abdomens. Although the morning was warm, about 60 degrees, the ants moved with short bursts of energy, slowing down in between. They seemed to use their antennae to sweep the nectar towards their heads. The morning was quiet. I heard only the sounds of birds, or the occasional airplane overhead. Are these ants in the same colony? Are they competitors? They seem to get along on the bud. They do not fight each other; there is plenty of nectar for each of them. They have no other objective than to do what they are doing. They have no schedule to keep. I spent only five minutes watching the ants, but it felt so much longer. My mind kept nagging me to get to work, to get going, to do. I had to exercise resolve to stay where I sat, to watch and breathe. Practicing the observation did not come naturally. What does it say about me, or about my culture, that it should be so challenging to be still for 1/288 of a day? 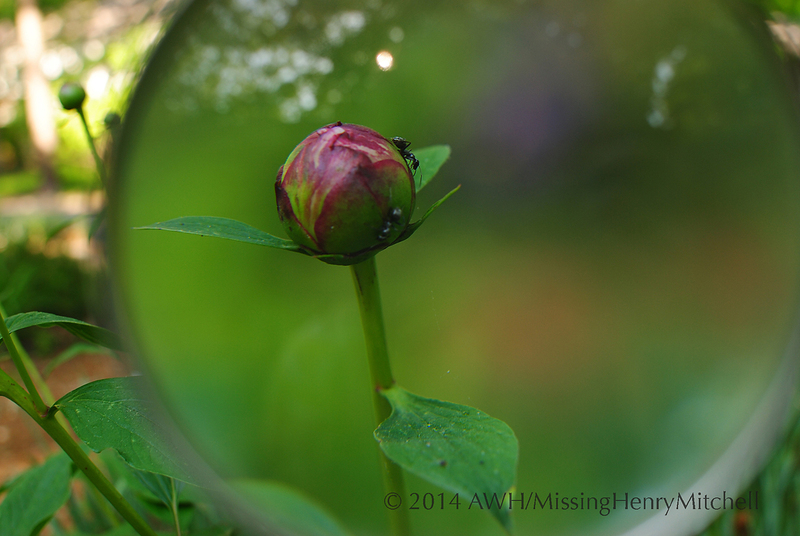 Looking through my magnifying glass, I think I can see the ants’ tongues. It turns out, however, that ants don’t really have tongues; they have fingerlike appendages called palps around their mouths. I don’t know if what I could see were the palps, or the mandibles moving. I’m inclined to think I saw the palps, as the mandibles are quite large. There is so much I don’t know about nature; ants are just the beginning of my ignorance. Perhaps one day I will read E. O Wilson’s definitive work. Henry Mitchell used to sit and watch irises unfurl. Fortunately for him, he did not live (at least, not for terribly long) in a world obsessed with the 24-hour news cycle; he had no cell phone nor email demanding his attention, so perhaps it was easier for him to disconnect. At any rate, I loved watching the ants, however challenging it became for me to stay present with them. I know I will try again next May. This entry was posted in 2014, Garden wildlife, Gardening as spiritual practice and tagged ants, garden insects, gardening, nature, observation, peonies by missinghenrymitchell. Bookmark the permalink. Thank you so much! He is wonderful, isn’t he? 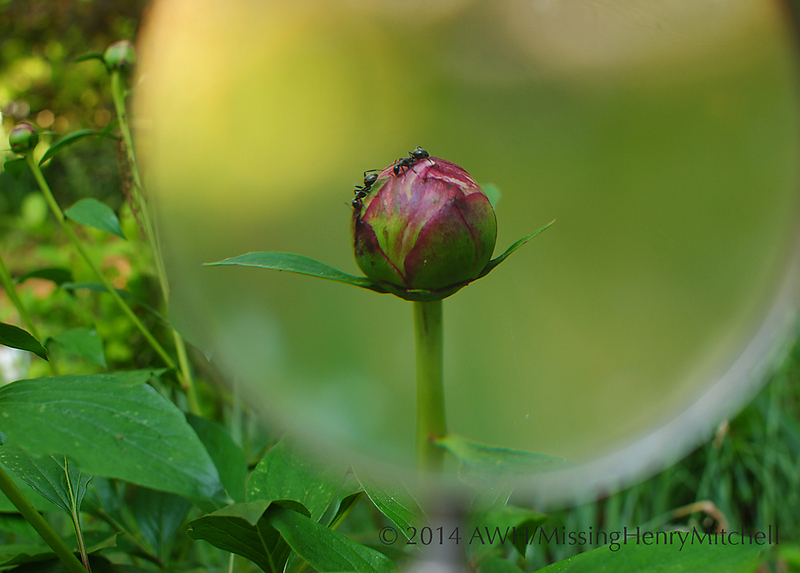 I also find ants on peonies kind of mesmerizing. Watching the bees climb in and out of Penstemon flowers has the same effect on me.